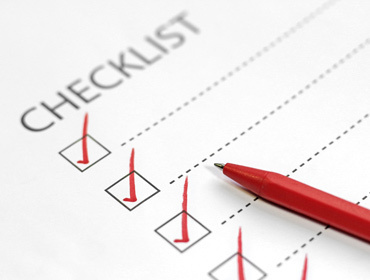 Is your franchise NOT getting as many phone calls as you need it to? Not getting enough phone leads is a major problem for many franchisors. When they struggle to not get enough leads it makes it harder to prove ROI and to sell new franchises, which leads to stunted growth. Even worse, when your franchisees are not getting enough leads, it usually causes fire-fighting for the franchisor and a lot of wasted time is spent on trying to appease franchisees. If so, we have good news for you! Let us break down how this all works in more detail below. Well, it’s most likely because you don’t know what your customers are thinking. If you actually knew what they wanted and gave it to them, they would do what you want them to. Which is buy from you, obviously. First, we have to understand how buyers shop. If they are on their phones they will most likely want to call or get driving directions. Google has published statistics all about this. And yet so many franchises are still optimizing their text ads for ‘click-to-website’ VS ‘click-to-call’, this immediately causes lower leads for franchises and it all extends from them not understanding the intent of their customers. Let’s look at an example because everyone learns better from live examples. Notice on the left screenshot and how these oil change companies are targeting users for the “click”, but that is not the user’s intent. The user’s intent is to ‘call’ or to get ‘driving directions’. The correct way to do this would be to setup your ad like the right-hand screenshot example. Notice how they have the “click to call” button visible? This is the correct way to setup an ad when it has the intent to call. When franchisees don’t understand this they optimize their AdWords campaigns all wrong and it leads to a lot less leads. Let’s unpack this even further so you can understand how important this is. 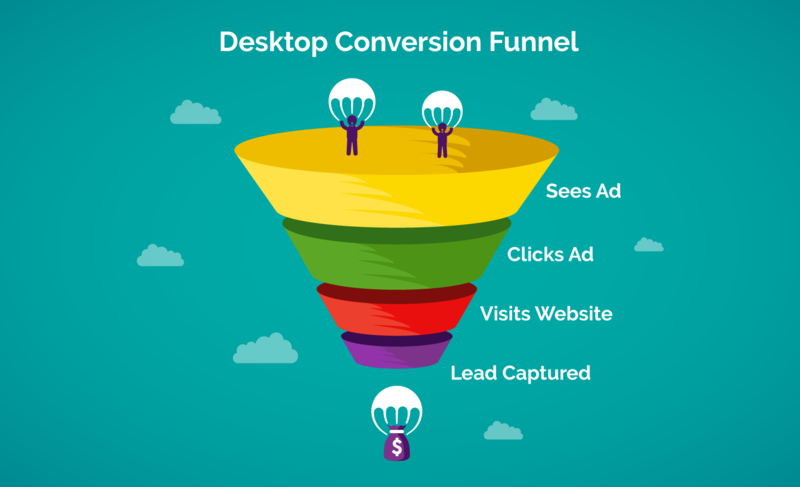 Let’s just look at the funnel process for a user between ‘click-to-website’ vs ‘click-to-call’ campaigns. Notice how the user needs to take 4 steps when you optimize for ‘click-to-website’ vs ‘click-to-call’? What makes it even worse is that most websites only convert at 5%, which means 95% of that traffic bounces and never returns again. It’s kinda like flushing 95 cents of every dollar you spend on AdWords down the drain. Now if you optimize for the ‘click-to-call’ the user does not need to take the extra step AND it’s immediately a lead!!! How would you like each ‘click’ to become a ‘lead’ instead? 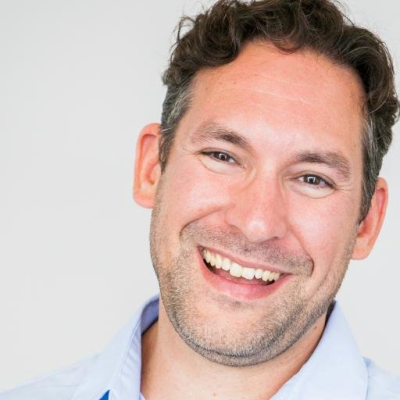 Just imagine how much more profitable your franchises would be if every click became a lead, instead of only 5% of your clicks becoming a lead. I bet you’d wouldn’t have any trouble keeping franchisees happy and hitting your franchisor growth goals, would you? We know that when users are on their phones they want to see 3 more things besides the phone number to be able to make a decision. Directions – They want to know how far your business is from their location. If you read between the lines, Google already knows this too and this is why they serve up Google Maps listings based on people’s locations automatically. PRO TIP: Only run your ad that targets the right driving distance. It’s different for different communities. Example city culture will only drive 1-5 KMs to get something. But in rural areas people, will drive up to 20-30 KM to get something. Reviews – They want to know you have good reviews. Texting – Millennials do not call. They text. If you buyers are younger, then you may want to let people text your business, in addition to calling. Price – People are also doing comparison shopping on the spot. If they are in a store, they often see if it’s cheaper anywhere else that is within a short distance away. Yes, you want to have all this information easily accessible on your website. 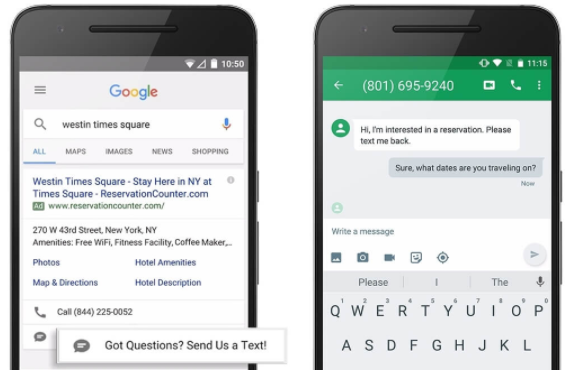 But when you setup your AdWords campaigns for ‘click-to-call,’ all your content is ALL in your text ad. 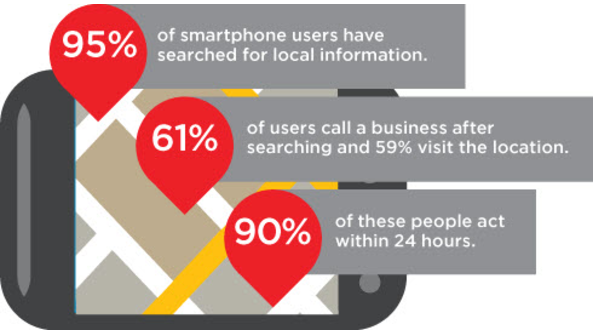 Location Drive people to physical business locations. 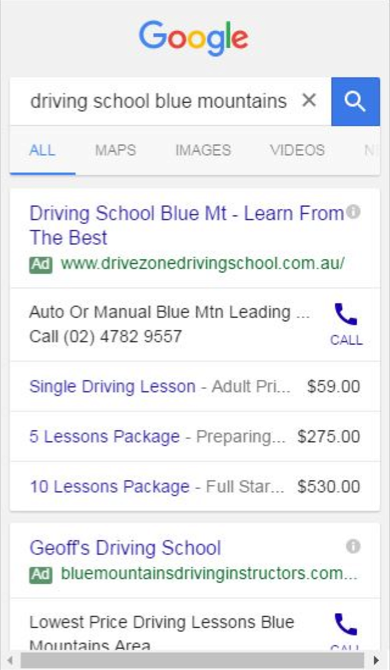 Tie your GMB listing to your AdWords account and it will pull in the close location + your Google Reviews, which can show those wonderful review rich snippets. 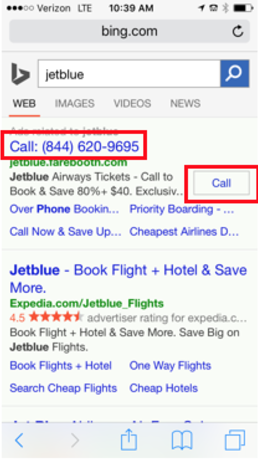 Note that “click-to-call” ads are NOT just an AdWords thing. 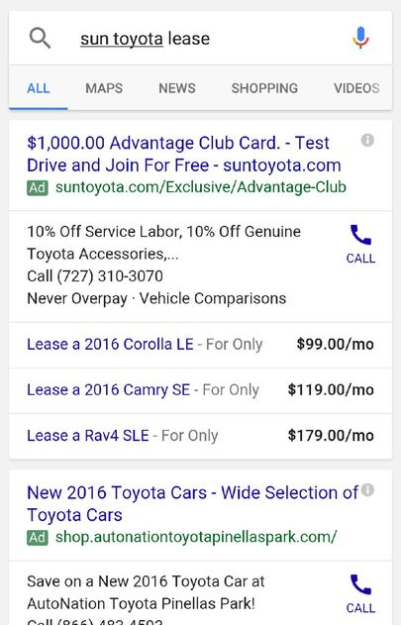 Be sure to check that you are also running those ads on mobile devices for Bing PPC too. Look at how much more screen real estate you can capture with your ad when you use price extensions. 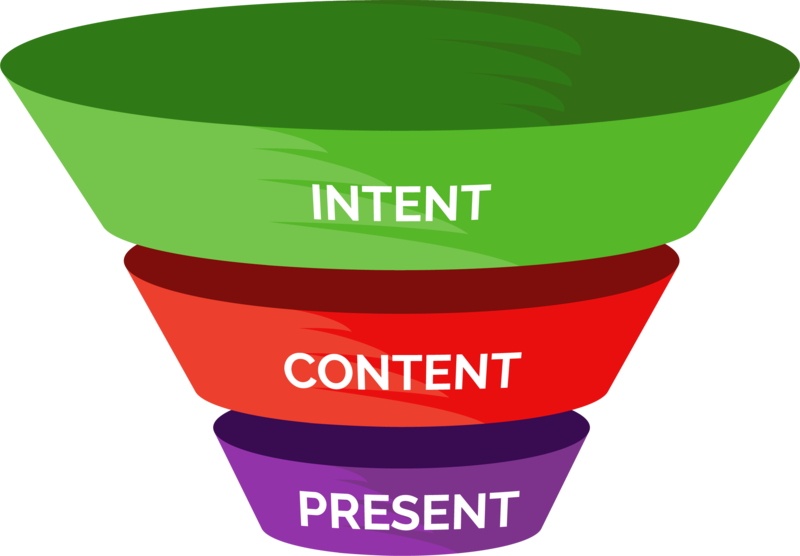 Just be sure to make sure your PPC manager focuses on the best 3 because they will only usually show 3 prices. Make sure you know what your best products are too. Notice how when you connect your GMB listings to your AdWords account, you can also pull in that wonderful review rich snippet too. It really makes your ad pop! The only con about a review extension is that links out to the review if they click on that part of the extension, which can drive traffic away from your website. So if you decide to use this extension really make sure it does a great job at pre-selling your product(s)/service(s). This is pretty powerful stuff. A text is like a phone call, it’s an instant lead! I’ll take a lead over a website click any day. How Can This Help My Business Today? 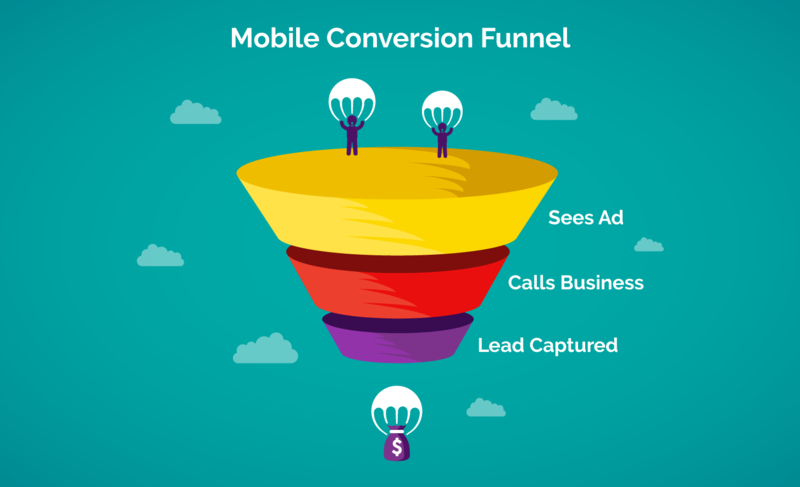 It’s important to know that you can increase your phone leads IF you give people what they are looking for and minimize the steps they need to take to get that information. Add price, text & review extension where appropriate. 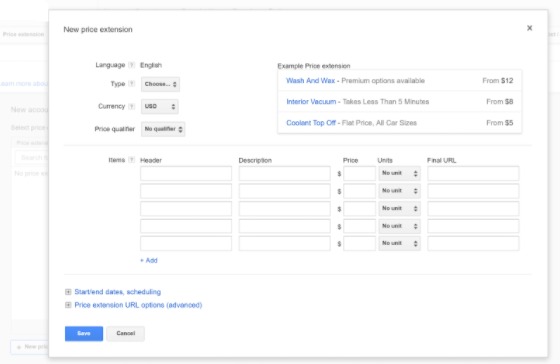 Now, this is ONLY 1 thing you need to think about when launching a successful AdWords campaign. There is another 79 items you need to think about. If you want to learn more about what to look for (and look out for) with your PPC campaigns then we invite you to download our AdWords 80-Point Checklist for free!